To kickoff our 2011 season our 2010 robot was the golf putting pro at an SBPLI golf tournament fundraiser. With the attitude that soccer is sort of like golf, only with a smaller ball and a tiny goal pointed into the ground, we attempted to beat seasoned golfers at their own game on September 14 at the Stonebridge golf links in Hauppauge off route 347. Whenever we can we like to help out SBPLI with their fundraising to host the Long Island Regional and our local FLL tournaments. Our own Mr. McLeod was one of the honorees at this year's event. To avoid playing golf (baseball is more his speed) he'll be meeting and greeting at the putting green with our robot and Nolan, Ben, Billy, Sean as they became available after school. Mr. Schuler one of our original team mentors and an avid golfer served as our robot's golf coach. The robot was a little too accurate, so we added a random mess-up factor to give the contestants a chance, after all they're only humans. We planned a series of team workshops to cover mechanical systems, electrical systems, programming, and pneumatics for our newest team members and the old one's too! Through the fall we held team meetings every other Tuesday evening for these workshops. Hampton Bays rookie members attended the basic programming workshop. We did some workshops at other team sites like Comeswogue. Officers held a demonstration and discussion with superintendents, administrators and teachers from the tri-state area at the annual TRI-state district review. 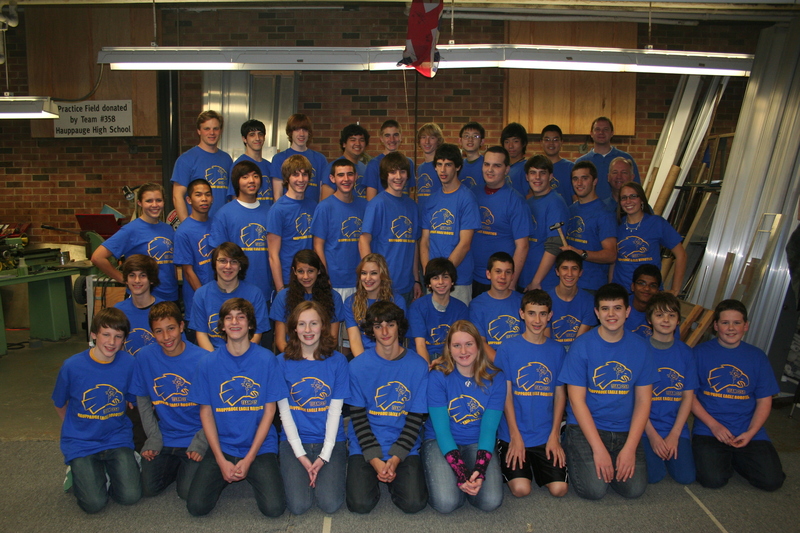 We held an industrial park bike tour, added a team 358 Twitter phone-text feed, went neighborhood Team caroling, held lunch room demonstrations to attract new team members and raise awareness of the team across the school, and team mentors and students served as FLL judge volunteers at district and tournament events. Saturday, October 16 - Deer Park Invitational off-season event, 15 robots played. 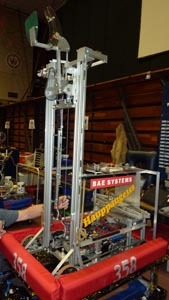 We picked up a loaner robot from Bethpage HS for three pre-rookie teams to share at the off-season event. It had a few driving problems that were fixed by swapping slick wheels for sticky, shortening chain, and adding zip-tie chain tensioners. We also mounted their controls on an old Hauppauge driver board and added old Hauppauge bumpers that we had to tape over to disguise them and add the Bethpage team number. We were out of red fabric having given it all to a rookie team last season, so we made red covers out of red duct tape and stenciled on the Bethpage team number. We had a long field setup the day before. No one brought a tape measure long enough to measure the full field, so a couple of mentors from PoBots and Lindenhurst ran home for theirs. The single center gate ended up on the wrong side of the field and one end wall got pushed over inadvertently making a large crash. Anyway, the field eventually came together, but the field management system kept crashing. That problem was eventually solved by the simple expedient of powering down/up the entire server case. We also experimented with a new robot wi-fi bridge on the 358 robot, but could not get it to be recognized by the field router. It was a 5v model, so it also needed a separate 12v-to-5v power converter. We were able to run a match on time with administrators and new team leaders with four robots driven by leaders from Hampton Bays, Brentwood, Half Hollow Hills and a new administrator at Deer Park. The practice and qualifying matches list and the regular matches themselves were delayed two hours by all this though. Ben and Courtney served as score keepers and Mr. McLeod as field tech. 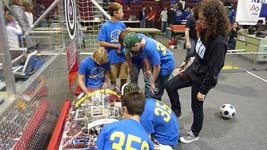 Most of our team members got a chance to drive the robot in competition. Nolan was picked to be interviewed by a local news film crew. We played 5 Quarterfinals matches after being chosen by Hicksville (1468) and Smithtown (810), but eventually lost. Homecoming parade was on a beautiful, warm, sunny day. The float got populated and decorated right after the ACT testing hosted at Hauppauge was over. Mr. Solaski donated the use of his vehicle to pull the school trailer (and have an eagle head tied to his roof). We lined up at Whiporwil about 3:00 and the parade stepped off just after 3:30. We gave out candy along the way, at least what was left of it after we snacked all along the parade route. Nolan was Homecoming king and rode a bit behind us in a classic Bel Air convertible. We had one alumnus, Christopher Fortmeyer, come home from school to march with us along with most of his family. A food fest followed the parade and after the football game Hauppauge had the traditional fireworks. Up early on this bright, sunny fall day were the pumpkin chuckers at the annual pumpkin catapult contest out at Suffolk County farm. Mr Dowd and many of our team members participated for the first time this year and built several, bringing home trophies for accuracy, crowd favorite, as well as 3rd place for distance. One catapult had a catastrophic break in the throwing arm, but not before winning the 3rd place for distance. Came time for Safe Halloween there was quite a crowd in the Commons. The early arrivers were the children of Hauppauge teachers. It's always fun to see your teacher has a family. 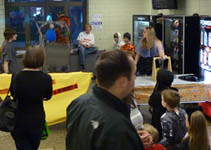 The robot was setup the night before in one corner of the Commons, barricaded by tables to keep the munchkins safe (sticking to the safe halloween theme). We played our, by now very traditional, game of catch with the robot. The kids threw and the robot dodged with a tote they were trying to make it into. The robot dodged a little less the smaller the trick-or-treaters were, practically edging up to the table for the youngest ones. Batteries kept getting exhausted, and the pin holding a gear loosened up, so after awhile the arm wouldn't go up and down any more, but the flashing blue light from 2003 kept drawing a crowd of youngsters. Great day, starting with everyone taking a wrong turn and arriving a bit late. "Luckily," the field had problems that delayed the event for awhile, so everything was cool. The driver team outdid themselves with full-body blue man outfits. No more short-shorts... The goggles fit best under the masks, but it was really hard to see much, so the masks had to get pushed up during the match. The outfits really stood out and looked really, really good. The traditional Evil Sundae (nobody said there'd be ice cream involved) eating contest was taken on by one of our freshmen members, they'll eat anything I suppose. One of the parents attended a couple of workshops on fundraising and scholarships. Our freshmen got a chance to drive and we ended up as captain of the 5th alliance. We chose Team 1740, Adams Robotics from Ozone Park and Team 224, the Tribe from Piscataway, NJ, but were knocked out in the semifinals after losing the sprocket bolts on two of our wheels and limping a bit at the end there. We were awarded the Alumni's Choice award after being voted the favorite team of Team 25's alumni. 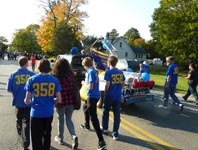 We loaned two past robots to the rookie teams at Brentwood and Half Hollow Hills in the fall for them to drive, use to attract members and see how it all goes together. Brentwood teachers came for a visit to discuss the program, and several our student seniors went to visit Half Hollow Hills to talk with the team and parents. One of the Half Hollow Hills teachers is the parent of one of our Hauppauge team members. 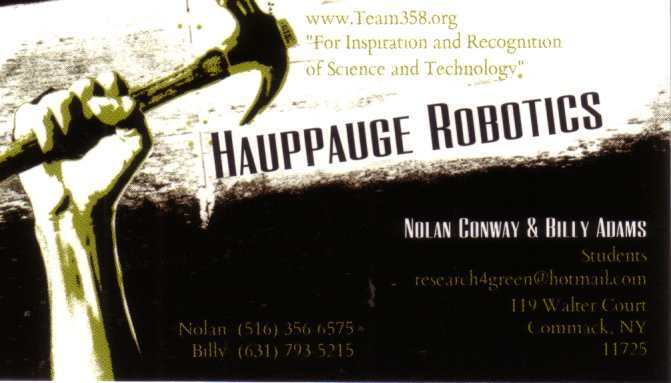 Our 2010 robot was featured at the annual Hauppauge Middle School science fair. We setup in the teacher's lounge as usual and talked about robots while giving periodic driving/kicking demonstrations. A past competition DVD played in the background and people gathered around in=between demos to listen to the team officers expound on how the robot worked, and the game it played. We had a surprisingly large attendance for this one. It was standing room only for this annual briefing on changes in the Kit of Parts, issues and how to work with the new components. After Kickoff, 6 weeks of build went before we knew it. We had interviews by Hauppauge Patch a community Blog site and Eagle's Nest the high school television crew, News 12 at the Deer Park Invitational, and the officers contacted MSG Varsity, Cablevision's coverage of high school sports and activities, and convinced them to cover the SBPLI Regional. We help bake sales at the doors for the school bus crowd after the end of the day. We got a donation of out-modeled kitchen and bathroom fixtures that we scrapped the brass from for $530. We sold some Anorad excessed power supplies for $673. We returned soda and water bottles for their deposits. We received another grant from BAE for $1000. Wendy's gave us a percentage of the proceeds raised on an off-night once a month. Gershow Recycling had a day for all teams to come down and pick through their scrap aluminum. 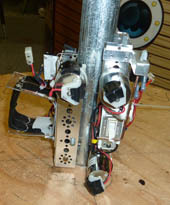 Most of it immediately ended up as parts on the main robot as well as the minibot. 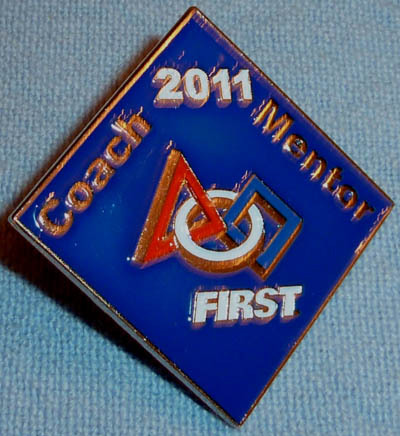 Mr. McLeod volunteered as a Control System Advisor for the NJ regional, the same as last year. He likes to see the problems teams encounter first-hand and in the thick of it all! Minibots ruled the qualifying rounds, because they were so few and so rarely deployed successfully. 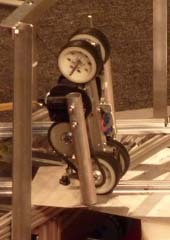 The only problem with the field was the minibot sensor at the top of the poles. 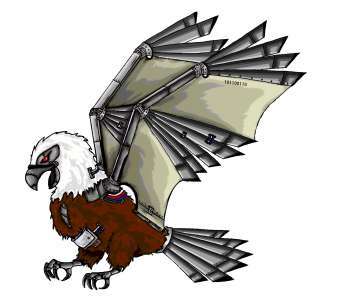 Initially the sensors were set to the 2-4 neutons of force specified in the rules, however, FIRST discovered that this made them susceptible to hard hits on the tower base by the big hostbots. The refs countered this by scoring the minibot races by hand while the FIRST crew tinkered with the sensitivity and timing. The coach bus left the teacher's parking lot Wednesday afternoon for Worcester, MA. We stayed at the Marriott Courtyard again, within walking distance of the college. 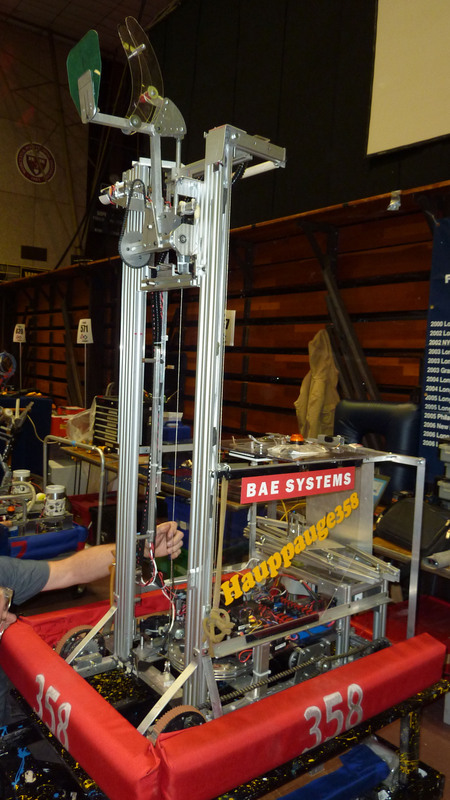 The Half Hollow Hills team leader, Rachael's dad, joined us at WPI on friday to see the competition first hand. At our first event we didn't try to make a single practice match until our very last one, where we found our robot radio had been setup incorrectly, so for our one practice match we got bypassed by the field anyway. Not so short shorts were the drive team dress code for practice day, but the next day our Blue Man drive team went to work with a vengeance. No worries, we proceeded to break our gripper welds in our first match and had to play most of the event without any way to hold a tube. 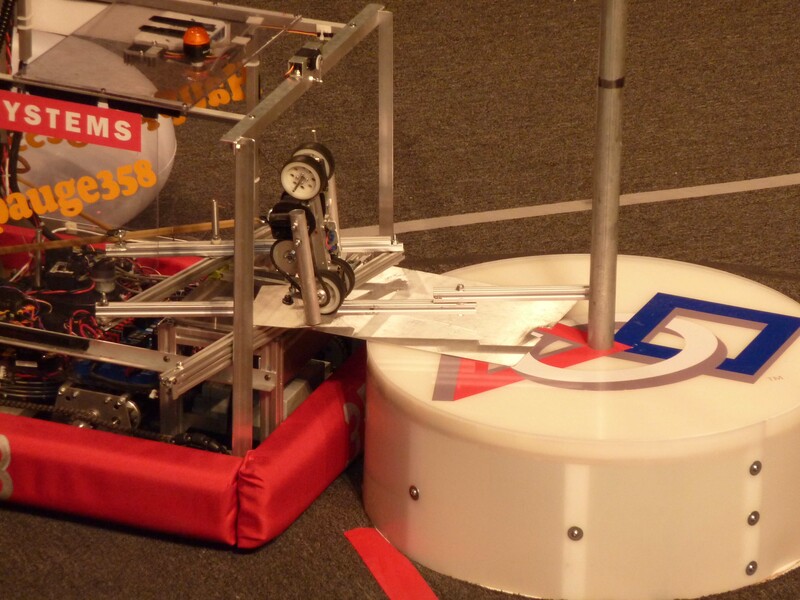 This put us on the defensive, literally, to prevent opponent scores and depend on our minibot to score all our points for us. This worked out so well that when our gripper was finally restored the drive team continued to play a defensive style to keep match scores low and force them to be determined by the minibot race to the top. 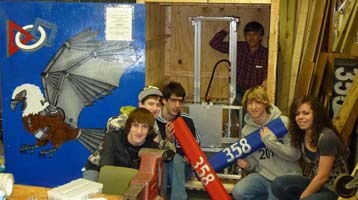 Since only a handful of teams had successful minibot deployments, we usually had a clear advantage. 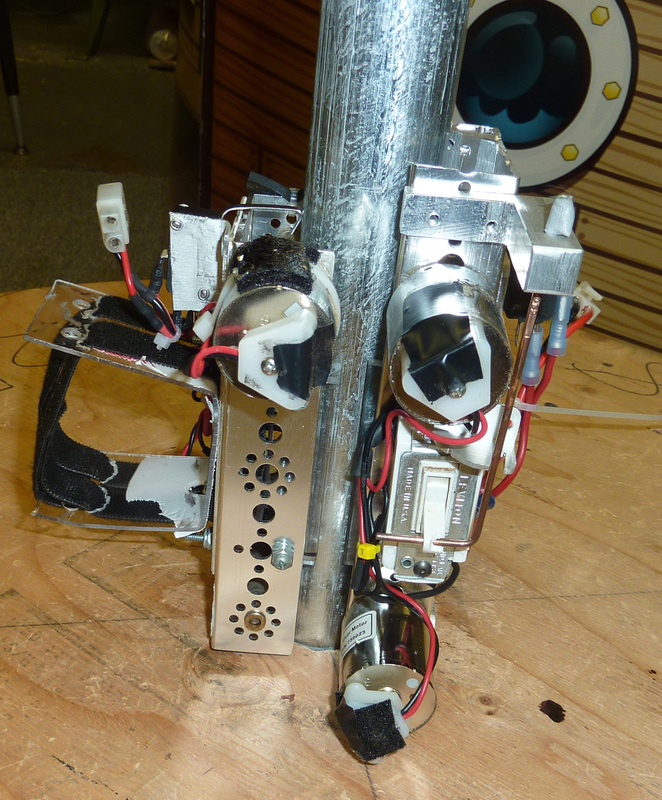 Our original "prototype" minibot was slow, but dependable. It proved our policy of not disassembling working prototypes, since they have a dependable tendency to become the real thing once competition begins. We ended qualifiers ranked #1 with this strategy and Captained the #1 alliance. #1 is actually a difficult place to be with such a small field of robots to choose from, because we have the honor of making the very first and very last pick. Scouting was very important for us here and our newest scout team did an outstanding job of tracking every single team. Elimination rounds saw us join with Team 190 (the WPI host team), and Team 2437 from Hawaii, making it to the semi-finals, but falling to the eventual winners. We did not come home empty handed! We were awarded Leadership in controls at the Friday closing ceremony for our driver control and feedback system. The evening we helped setup the Hofstra field for the next day's SBPLI Regional, we also helped our neighboring school district Smithtown by demoing last year's robot at their Math & Science Fair. It was to promote FIRST and to recruit students/parents for Smithtown Team 810. A new 1 second minibot based on Frank Saladino's reiterative design. Interchangeable with our original prototype minibot as a backup. The ability to hang tubes again, after the gripper weld broke at WPI. Brought us to #6 seed. We allied with team 884 Malvern and team 1358 MacArthur to go as far as the semi-finals. 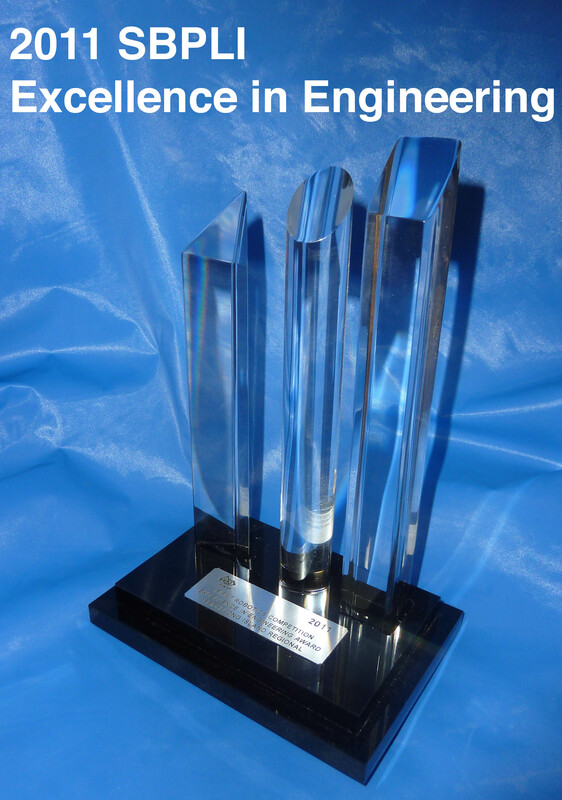 The judges, and Nolan's sweet tongue, awarded us the SBPLI Excellence in Engineering award. Members of several LI teams, including 358, helped out a Fredericksburg, VA team 2402 for the weekend of the VA Regional in Richmond. 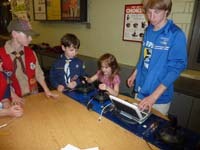 Robotics was the main attraction for Cub Scout Pack 589 meeting in the HS Commons - driving the 2011 robot and building competing towers of a single sheet of paper. Mr. Schuler, one of our founding mentors who has moved on, was tapped to become President of SBPLI, the parent organization responsible for running the FIRST events on Long Island. A fun time, everyone brought covered dishes and the whole family was there. A slideshow of the year in review played while we ate. Our outgoing officers and seniors spoke about each of the team advisors and mentors, both engineering and non-engineering mentors, including all the parents who helped out through the Booster Club responsibilities of fundraising and travel. The men received compact, mini-screw driver/socket and a belt tool pounch, while the ladies got flowers. The new officers were announced and presented, then the team advisors recognized each of the outgoing seniors with graduation cords for robotics and gifts prepared by the Booster Club. A big thanks to Mrs. Bosi for organizing the dinner and the awards!